I've had a super busy day today! It's 7:00 pm, and I'm just now sitting down at home. This morning, my dad asked if I wanted to go visit Mark, and I was feeling a lot better, so I said sure. He told me he'd pick me up at 8:45 (which was in an hour). He came over to walk the kids to the bus stop, and the second they left, I headed out for a four-mile run. I knew it was going to be a busy day, so I wanted to get it done before heading to the hospital. I ran four miles and then hopped in the shower to get ready. I scarfed down some oatmeal for breakfast just in time for my dad to pick me up. We stopped at the post office on the way to the hospital so that I could check the P.O. Box. I was delighted to see that there were a ton of cards in there for Mark. On the way to the hospital, I counted them, and there were 52! I was really excited to give them to him. When we went up to his room, Mark was really happy to see us. I showed him the cards, and explained that they were ALL for him. I opened each card and read it out loud to him, then passed it to him to see. He kept saying, "Oh, that's a nice card!" to all of them, like it was the best card he's ever received. And they were all so nice... I honestly can't thank you enough for all of the thought that went into those cards! Mark kept saying, "So many people care about me, I have all these people that care about me." I didn't want to cry or get upset in front of him, because he's just so HAPPY, so reading the cards was really hard for me. I get emotional while watching Hallmark commercials, for goodness sake! Every once in a while, out of nowhere, he would tell me just how excited he was to go "home". I felt bad about that, because I know that he's not going back to the home that he's known for nearly his entire life. When I mentioned something about "home", he said, "NO, not 'home'... I mean 'HOME home'." When I asked further, he explained that he is excited to go to his real home, to Heaven, to see his family. He talked about "HOME home" a lot while I was there, and I have to say, it was really comforting to hear him be at peace about it. It would be so hard to hear him talk about fear of dying or something like that, but Mark will be happy whether he miraculously beats this cancer or he goes "home". I learned today that Mark's brother died of lung cancer a few years ago, their father died of lung cancer, and their grandfather died of lung cancer. After I read all the cards to him, his nephew showed up. His nephew is his only living relative. My dad chatted with his nephew, so I talked to Mark some more. I asked him if I could bring him anything next time I go visit, and he said his usual response, "Oh, any old thing." But I pressed him harder, and said, "Mark, is there something you REALLY love that you would like me to bring you? Anything at all?" and he started to come up with a few ideas. He loves junk food--so much so that we are probably soul mates ;) He said he wants hush puppies and fish from Long John Silvers; Cheetos; cheese popcorn; candy bars, or any kind of chocolate; and a milkshake. So I'm going to bring him some goodies the next time I go, probably on Saturday. My dad and I stayed for a couple of hours, and then we had to head out because I had to go to the school for the kids' Christmas party. I'm so glad that I got to go visit Mark! He's positive and happy, and it just radiates off of him. He kept thanking the nurses for everything--even after they gave him an injection, he'd say "Thank you!" I was feeling so sad about his situation last night, during a long talk with Jerry about it; but today, I feel a million times better after seeing how happy he is. When I got home, I had about 30 minutes to eat lunch and then head out to the school. The kids had their Christmas parties, so I was there to help, although it really wasn't needed (lots of parents there!). 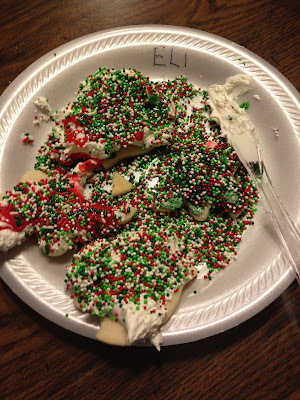 Right after school, we went to my Aunt Mickey's house so the kids could decorate Christmas cookies with her grandkids. It's something that we do every year, and the kids really look forward to it. My Aunt Mickey always cooks dinner for everyone, and every year, I don't eat there because I'm trying to "stay on track". After visiting Mark today, I was just thinking about how dumb it is to skip out on things like that. My aunt makes really great food! So I took a plate, and ate what she made, and I enjoyed every bite. I even had a couple of cookies that the kids made for me. Tomorrow, I'll be more careful, but I'm glad that I ate dinner there today. Mark having cancer has made me stop and think (more than a few times) about what is really important! The one on the left even has a huge bite out of it, haha. Despite being a super busy day, it's been a very good one! I bought Mark a card last night, but after reading this post, I found a postcard in my collection (I've been collecting postcards for years). I'll be sending it out in the morning. I've thought about him all week, and I don't even know him! He's so sweet! Mark's story is so sweet and heartwarming. I love that your blog has allowed thousands of people to "know" him. It's such a hard situation, but to me, the silver lining is that his amazing spirit has inspired not only the people he's interacted with his whole life, but also thousands of strangers - to smile more and love every second of life. He's a blessing to all of us! You are truly an amazing friend to do this for Mark. His optimism has made me stop and really live in the moment. I'm blessed just to be living right here and now and I'm not worrying about getting everything done. Mark's appreciation for the simple things and positive attitude is affecting people far and wide. This will be his legacy. I sent a card last week and I'm glad it made him smile. I'll be sending postcards from sunny (not so much today) California. Thank you Mark for making stop and smell the roses! Katie, you are so sweet and caring! I am going to try to get a card mailed tomorrow to your special friend Mark. Sounds like he could teach us all something about contentment and faith! Ha ha ha! You're not kidding about the cookies.....I'm not even sure I would eat those (and I'd eat just about anything- *hangs head in shame*) My card is on its way to Mark with some simple jokes to cheer him up! I sent out a card yesterday - I hope it makes it! I've never sent mail to the United States before so I'm not sure how long it will take to get there (or even if I used enough postage. LOL). Mark's story has really touched me and I'm so glad that he is loving the cards and notes so far. It's amazing how such a small act can make such a difference in the life of another. Our picture postcard from Germany is on its way! Mark is such a special person! Your post brought tears to my eyes.. He is such a happy person. I am making a trip to the store today so i will pick him up a card to send your way. Katie - Thanks for taking your time to do this! Cancer (and especially lung cancer) can be so lonely. That is so nice for you to do these things for Mark! LOL at the cookies. My son was decorating his and instead of sprinkling the sprinkles lightly, he kind of dumped it over so there was a HUGE pile on one cookie. He just looked at me with this look that said, "What do I do now?" Haha I think it's good you ate there. I am trying to be normal in regards to things like that without going overboard. It's not easy! That is just the sweetest thing! I'm glad he liked all his cards. I will have to look for a post card to send him when I go out shopping today. LOL on the cookies! Got sprinkles??? So glad to read your decision about eating dinner with your family. You do an amazing job of staying on track, planning and doing what you're "supposed" to do but sometimes living is just more important. We only go around once so there should be some fun involved. Best part was reading that you enjoyed every bite and didn't feel bad. ENJOY! Sounds like an excellent visit with Mark - everybody enjoyed it. Best wishes. I wish that more people were like Mark. Actually... I wish I knew someone as positive and content as Mark. He sounds like such a great guy to hang out with. I wish him all the best. Super happy that you ENJOYED your dinner with your family.... it is a wonderful reminder for all of us. I have just read your post about Mark I am in the UK and its to late to send him a card but please wish him well with his struggle. I have watched 2 very special people in my life lose their fights one with lung cancer and its the little things that count the most. Just someone to hold their hand and I pray he will have his peace and go to a happy home with love an grace. God bless Mark.